Valentines Day is a time of love. A time to show that special someone how much you care. A time to indulge in all the treats with that special someone. When it comes to treats, what says “I Love You” more than a super tasty Valentines Day treat? I have compiled a list of 14 super cute and mighty tasty Valentines Day treats, sourced from some pretty amazing bloggers. Click through on the links for the full recipes. Enjoy! Check out Monica’s delicious heart-shaped Sugar Cookies with Cream Cheese Frosting! These Valentine’s Day Fairy Bread Treats from 5 Minutes For Mom are super cute! Jennifer whipped up some Chocolate Mousse for Two, and they look delicious! These Be My Valentine Sugar Cookies not only taste delicious, but they say I love you in so many ways! Red Velvet Cake Milkshake has a mouthwatering red velvet cake batter taste topped with whip cream and sprinkles. Mmmmmm! This Strawberry 2 Ingredient Fudge recipe is the perfect fast and easy treat to make just in time for Valentine’s Day! Maple + Bacon + Cookie Butter. Could there be anything better? Check out this Maple Bacon Cookie Butter Popcorn Balls recipe! Christine’s 3 Valentine Sweets: Chocolate Valentine’s Pudding, Valentine Ice Cream Cake, and Salted Caramel Hot Chocolate… the perfect trifecta! These cute little Valentine Pretzels are a great project to get your kids in the kitchen. Chocolate and sprinkles, it just doesn’t get any better than that, does it? 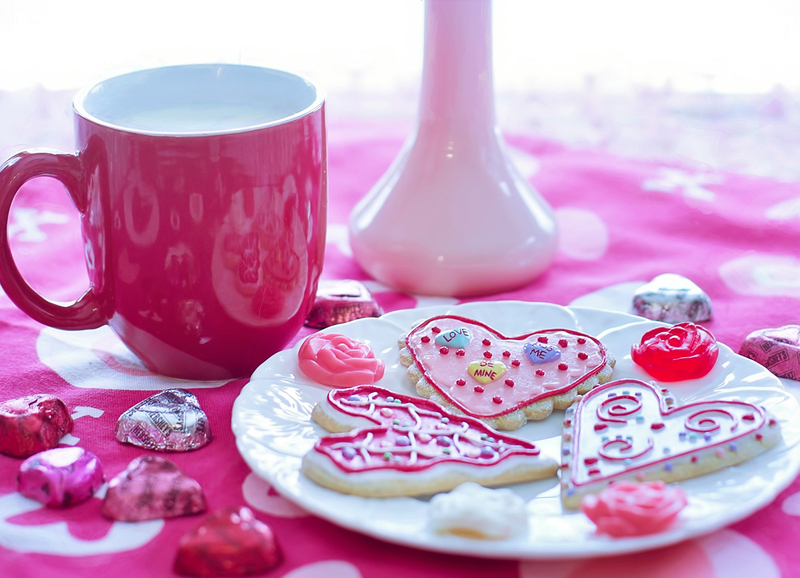 These heart-shaped Valentine’s Day cookies look almost too good to eat… almost! Valentne’s Day and Chocolate Dipped Strawberries go hand in hand. Add a splash of colour to a classic cookie and voila, you have Valentine Chocolate Chip Cookies! This Easy Peasy Red Velvet Fudge is super easy – no bake! Woo hoo for the non-bakers! Aren’t these Meringue Cookies with a Chocolate Centre the cutest ever? Valentines Day 2019 Round Up! Hope you enjoyed “A Round Up of 14 Super Cute Valentines Day Treats”. Enjoy making them. Enjoy eating them. Have a Valentines Day filled with love and tasty treats! Disclaimer: I was given permission by each participating blogger to use their recipe and a picture from their original post in this 2019 Valentines Day Treats roundup. All opinions are my own.